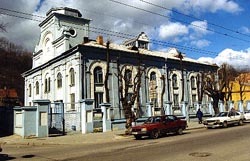 The majority of the remaining stone synagogues were built in the second half of 19th - beginning of 20th century, in the age of Historicism (Historicism is the architectural trend, based on imitation of the stylistic forms of the past). During this time Jewish communities in many towns built the second synagogue, next to the one which had already been standing there (in Kedainiai, Jonishkis, Kalvarija, Eishishkes etc.). Interesting complexes of three houses appeared in Kedainiai (two synagogues and a house of a butcher) and in Kalvarija (pictures 4 and 5). The diversity of styles predominates over the architecture of Historicism synagogues, from the simple forms of no-style architecture to the fanciful interpretations of mediaeval or oriental forms. There are very few décor elements on the exterior, with the prevailing David's star and the motive of Ten Commandments. The polychromatic play is employed in the "brick style" or stone buildings: the combination of bricks in two colors and white plaster edgings. Both functioning choral synagogues in Vilnius and Kaunas were built in the age of Historicism, too. The synagogue in Vilnius contains the elements of the architecture of neo-Romanticism and characteristic oriental symbolism. The Choral synagogue in Kaunas. The forms of the synagogue in Kaunas are simpler, neo-Baroque, its layout rectangular, with a three wall annex. 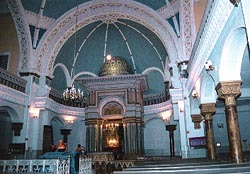 Summarizing the architecture of synagogues of all ages and epochs, one can notice that their volume and exterior were influenced by the change of local traditions and forms, whereas the oriental origins of the building were revealed in the interior through the elements of décor characteristic to Jewish art, usually the exotic motives of flora and fauna. At the moment, Lithuania faces the complicated problem of the reconstruction of the remaining synagogues, and their proper employment. Jankeviciene A. Vilniaus Didioji sinagoga. V. 1996. Janulaitis A. ydai Lietuvoje. K. 1923. Baliulis A., Mikulionis S., Mikinis A. Traku miestas ir pilys. V. "Mokslas" 1991.